All our rooms have a private balcony, air conditioning, television, refrigerator. The Studios and triple rooms also feature kitchen,satelite TV and washing machine. All guests are welcome to use our garden for sunbathing, sip drinks, coffee, and enjoy nature. Parking and internet are free. Also all our guests have access to barbecue. My one and only complaint is that the hot water seemed to be a little hit or miss. 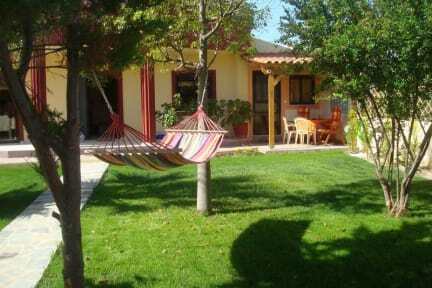 A quiet place, close to the beach, a few restaurants and a bus line to the centre. 5 km from city centre and the museums yet 10 feet from the beach! Wonderful couple on the place. Friendly and willing to deal with problems quickly. Staff was super generous, complicating and fair. There was a problem with our room on arrival so they got us a place across the street with a walk on beach access which was awesome. They also gave us free breakfast which was not included in our original deal. More than happy with the out come and would definitely stay again. A little ways out of town, but close to some good restaurants and supermarket. Awesome patio complete with a hammock! We got a very nice room with a small stove and convection oven. Bed was amazing as well as the bathroom. Room was quite modern, we think they are renovating the place and seem to be doing a wonderful job. Would stay again great value for money. It was decent, there was this one lady who I think owned the place that wasn't very nice but the rest of the staff was very friendly. The rooms are a bit bare but comfortable and had a mini kitchen set up which was nice. Towels were not clean. Bed was terrible and bed sheets were too small for the bed. No acoustic insulation and not very nice hosts. I definitely not recommend this place.